Cardiff City have signed Kenny Miller from Turkish side Bursaspor on an undisclosed deal after receiving international clearance. 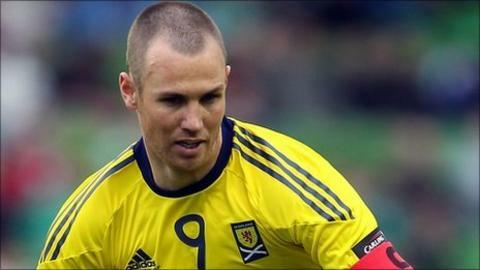 The Championship club is thought to have paid Bursaspor around £870,000 for the 31-year-old Scotland striker. Rangers had hoped to re-sign Miller but were reluctant to offer more than the £400,000 they received after selling him in January. The striker scored five goals in 15 appearances for Bursaspor last season. The Scotland international failed to settle in Turkey and met Bursaspor's directors in early July to gauge whether they would be willing to sell him. "He's an experienced player, a leader, he's someone who is a proven goalscorer and also someone who leads the line very well," said Cardiff manager Malky Mackay. "He's experienced at this level and has played international and European football. He's a real threat in front of goal." Mackay also hopes to complete the signing of France Under-19 international striker Rudy Gestede, who would become the ninth recruit of the new manager's reign. Strikers Miller, Joe Mason and Robert Earnshaw, defender Andrew Taylor, winger Craig Conway and midfielders Filip Kiss, Don Cowie and Aron Gunnarsson have all joined Cardiff since Mackay was appointed as Dave Jones' successor on 17 June. However, it seems as though Cardiff face stiff competition in the hunt to sign Dundee United striker David Goodwillie. Rangers had a £1m bid rejected a few weeks ago and then had a second offer rebuffed on Tuesday, while Blackpool are thought to be considering whether to meet United's £2m valuation. "We still need to fill the squad up," said Mackay. "Twelve players left in the summer and at the moment we're relying on four or five of our first-year professionals to supplement the squad. "So we certainly need to bring another couple of players in." Cardiff continue their pre-season preparations with a friendly at Yeovil Town on Tursday night.